I'm always excited when an author decides to visit The Book Diva's Reads, and doubly so when it's one of my favorited authors. I'm honored to host a visit from Andrea Kane, an author that I've come to know and relish by reading her psychological thriller novels and am getting to know and appreciate in a whole new way through her historical romance novels. Today, Ms. Kane will be discussing the growth of a character in the novel Samantha. A spin-off is a very complex thing to write. To my way of thinking, it has to be a stand-alone title, one that has its own complete story and its own complete characters. And yet, it also has to be seamlessly tied to the book from which it originated. 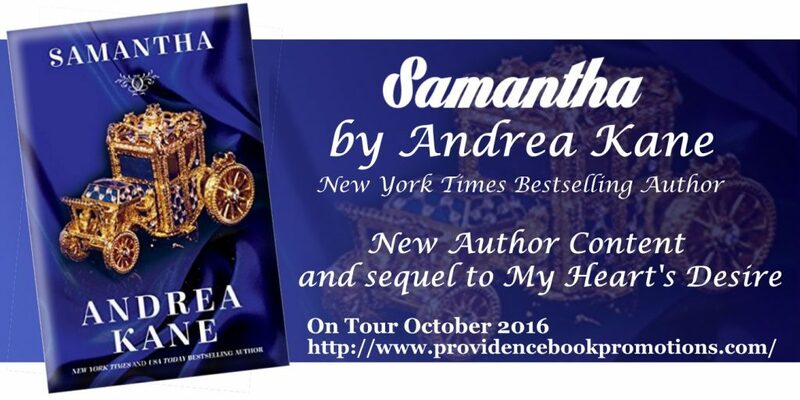 Samantha was my very first spin-off, born from my very first novel, My Heart's Desire. It was as special a book to me as Sammy was as a character. From the instant she appeared on the pages of My Heart's Desire—Drake's loyal and loving younger sister—I knew she had to have her own book. It wasn't a question of "if"; it was only a question of "when". And the "when" took some time—several years to be exact. Sammy had to grow up, and I had to mentally watch her do so. Transitioning from a precocious fifteen-year-old girl to a ready-to-take-on-the-world eighteen-year-old, Sammy embarked on her first London Season with her own ideas of what it would yield. And it wasn't a stream of boring noblemen courting her and trying to win her hand. Nor was it an endless sea of vapid parties and equally vapid conversation. No, Sammy's goal was to meet and marry the man of her dreams—a man that, with all her naiveté and innocence, she expected to walk into her life and automatically be the hero she'd imagined him to be. Naturally, things didn't go quite that way. As a result, even during the course of her own book, Sammy had some growing pains to overcome. And overcome them she did. She matured from an innocent young woman to a strong and determined adult, one who had to overcome dangers and to learn to fiercely protect the man she loved. And the man she loved was a complex and challenging man—a man she had to grow to understand, to heal, and to accept as her true and lifelong hero. I don't think I've ever loved writing a character more than I did Samantha. It was probably the romantic in me, the dreamer of happily-ever-after, and the believer in the age-old story of how true love conquers all. I hope you feel the same way after you've read Samantha! Remington Worth, the Earl of Gresham, is reputed to be anything but a hero. He is, however, intrigued by the fresh, young Lady Samantha. At sea, Remington had been a brilliant captain. To help save his country, he has accepted the Crown's commission to become the most deadly and loyal covert agent, posing as a notorious womanizer and blackmailer. His latest mission is to investigate the mysterious disappearances of England's prized merchant vessels. With an iron will, he will allow no one to get in his way or touch his heart—until Samantha. He had arrived...her long-awaited hero. It mattered not that he was a total stranger to her... nor that he patronized so seedy an establishment as this... nor that he pointedly displayed an ominous-looking knife handle from the top of one muddied Hessian boot. All that mattered was his towering height, his thick black hair, his uncompromising jaw, his piercing gray eyes. And that dimple...it was just where she'd always known it would be; in his left cheek. It flashed briefly as he nodded a greeting to someone, then vanished into the taut lines of his face. Yes, it was irrefutably he...the hero of all her fantasies. Without hesitating, Sammy flashed him a smile, drinking in his splendid, chiseled features and exciting, leashed power. He was just as she had imagined him...no, better. "Oh yes. Don't you see?" Sammy leaned forward, making an animated sweep with her hands. "It's as if Mrs. Radcliffe had penned it; a young woman alone...darkness...danger." A pause. "Of course I would have preferred a castle turret to a tavern..." she gave a philosophical shrug, "...nevertheless, you've arrived...and you're exactly as I pictured you." I read this book and Samantha was a wonderful character. Absolutely loved this title.